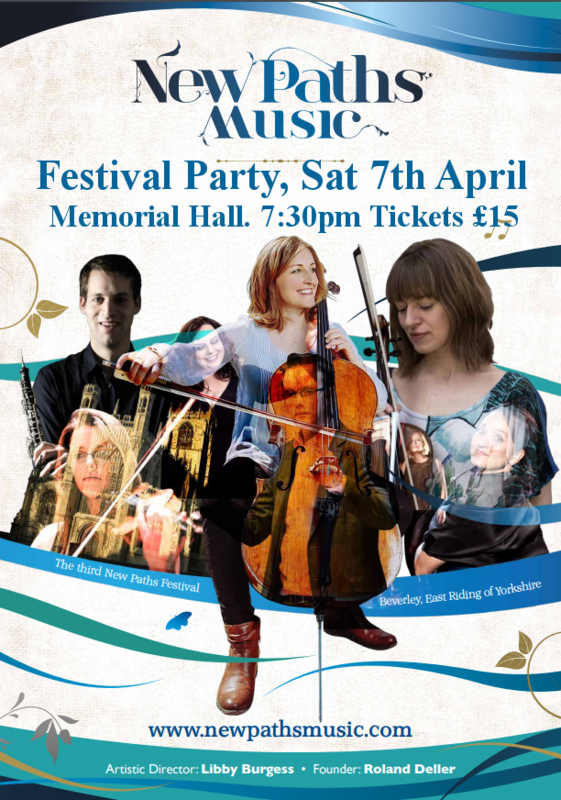 Saturday night is our musical party, blowing the lid off our folk theme – a big shindig for performers, audience, volunteers and the town of Beverley. A happy gathering that Norwegians would call folkefest (literally, ‘party people’). or In Person from The East Riding Theatre, Lord Roberts Road, Beverley. The music begins at 7.30pm with an informally presented concert of folk- and dance-inspired music given by the New Paths artists, who include some outstanding folk musicians. The stunning programme ranges from energetic Argentinian tango, to haunting folksong of the British Isles, and traditional music from Scandinavia. Benjamin Rimmer’s recent Rise for harp and string quartet is dreamy and magical, whilst the top-hit toe-tapping Danish music Woodworks will have you itching to dance! And so at 8.30pm we push back the chairs, get out the hay bales, and hand over to Triple Scotch, feted as the finest Ceilidh band in the UK, for two hours of solid barn dancing. Do-si-do! Pie and peas can be pre-booked for 7pm at a cost of £5: take a seat and make an evening of it. The Memorial Hall will be operating a cash bar throughout the evening. Detective – Crime – WhoDunit? Tickets £7.50 for adults, £6.50 for concessions, £19.00 for a family ticket. with licensed bar (except Wednesday). 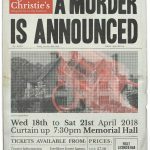 Beverley Theatre Company (BTC) are pleased to announce that Agatha Christie’s Miss Marple will be appearing at the Memorial Hall in their production of ‘A Murder is Announced’, an adaption of the Christie story by Leslie Darbon. The family and friends of Mrs. Blacklock are all bemused when the weekly copy of the Chipping Cleghorn Gazette arrives with a startling announcement in the personal column – that a murder is to take place at their home, that very day at 6.30pm. As more people, including a certain Miss Marple, pop in to check what is going on, the scene is set to see exactly what will happen when the clock reaches the appointed time. When a death does occur, it is up to Inspector Craddock to solve the crime – but can he do it without the help of Miss Marple, and before anyone else dies……..? 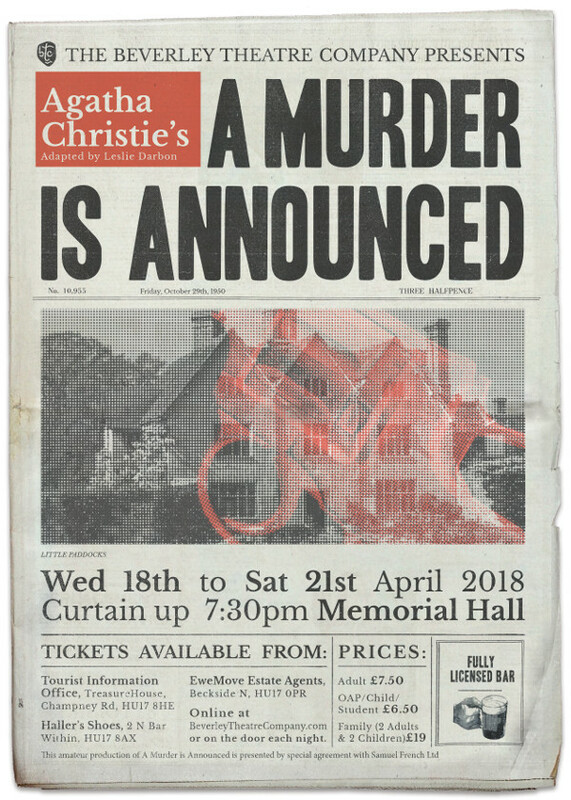 ‘A Murder is Announced’ is directed by Cheryl Giles, who previously took control of BTC’s production of Alan Ayckbourn’s ‘RolePlay’. This production sees the return of many familiar faces from BTC’s previous hugely successful staging of ‘The Vicar of Dibley’, with Zoe Conley, Emma Drew, Denise Dyble, Tony Musgrave, Nev Slater, Colin Walls and Bill Watts being joined by BTC stalwarts Pat McKenzie and Angela Chapman, and debuts from Kate Lindsay, Sarah Burnell and Paul Thomas. Beverley Theatre Company is keen to keep amateur theatre alive in Beverley and would be delighted if you would like to tread the boards with us or help backstage. Please contact us at thebeverleytheatrecompany@gmail.com or ring Denise Dyble, Membership Secretary on 07856 253311.